It didn't take long to raise a substantial chunk of money to repair the Wildland Firefighters Monument, which was vandalized two weeks ago. 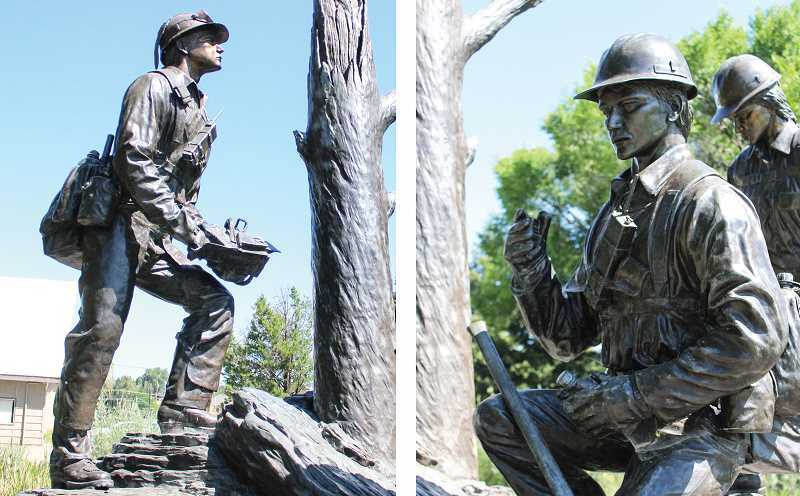 The bronze statue was created to honor 14 firefighters killed in the Storm King Mountain Fire in Colorado in 1994, nine of whom were Prineville Hot Shots. Vandals broke off a chainsaw blade and a cord for a handheld radio, angering and saddening citizens and local leaders alike. "Having been in law enforcement a long time, there are few things that can truly make me angry anymore, but today was an exception," Prineville Police Chief Dale Cummins wrote in a Facebook post. "How could anyone, regardless of age, damage such an important monument?" Within a couple of days of the vandalism, Sam Pearcy, wildland firefighter and battalion chief with Ochoco National Forest, established a GoFundMe account to raise money to repair the monument. "This memorial defines our city's heart and dedication to those who serve," Pearcy stated on its web page. In less than a week, enough donations came in to meet the $15,000 goal established for the fundraiser, and money continued to pour in afterward, pushing the total to more than $16,000. Many of the more than 200 individual donations that came in were for $100 or more, and two people donated $1,000. Money raised benefits the Crook County Parks and Recreation Foundation, a nonprofit that CCPRD Director Duane Garner said has typically handled maintenance and cleanup of the monument for the past several years. Garner explained that Marv and Anita Kelso, parents of fallen Prineville Hot Shot Jon Kelso, had initially coordinated care of the monument, but handed off the duties to the parks district along with some funds to carry out the work. He said that the money has not been used for routine maintenance but for special once-in-a-while needs. "When this whole (vandalism) thing happened, it made sense to try to direct funds toward that original account," he said. With more than $16,000 banked for repairs, the foundation can afford to not only replace the broken pieces of the statue, they can pay to refurbish the entire piece and make it look like new. In addition, the foundation will install bollards around the structure and add a decorative chain colored to match to the statue. Parks Supervisor Larry Penington initially reached out to David R. Nelson, the Colorado-based artist who built the sculpture, to repair the damage. He recommended the parks district seek someone closer to home, and someone more skilled in bronze repair work to fix the structure. "We talked and it would be a long way for him to come fix it, so he told me I needed to look at a forging house," Penington recalls. He ultimately found Tim Parks, of Enterprise, who will build most of the parts in his hometown before bringing them to Prineville to weld back onto the statue. Penington said the process will take about four days. No date is set for the work at this time, although he expects it will happen soon. In addition to the statue repairs and added security around the structure, money donated to the foundation will go toward repair of lighting along the firefighter memorial pathway west of the statue. The funds will also pay for installation of security cameras in the area. Garner said that City of Prineville IT Director James Wilson will coordinate that effort. Like many others, Garner was greatly troubled by the damage done to the memorial but was delighted to see how quickly people managed to raise the money to repair it. "This outpouring of generosity is simply amazing," he said. "Your generosity is balm to my soul, and I appreciate your gift and the outpouring of respect for those brave men and women who lost their lives serving us. They deserve it."